Should you find yourself in Shinjuku in the relatively near future, you might want to swing by the Capcom Bar. A whole slew of Rockman themed food and drinks were recently added to the menu. There's Cut Man stew, groveling Dr. Wily ice cream, Orange Metool squash, and a Blues Shield cocktail (the scarf is a lemon peel) among other delights. 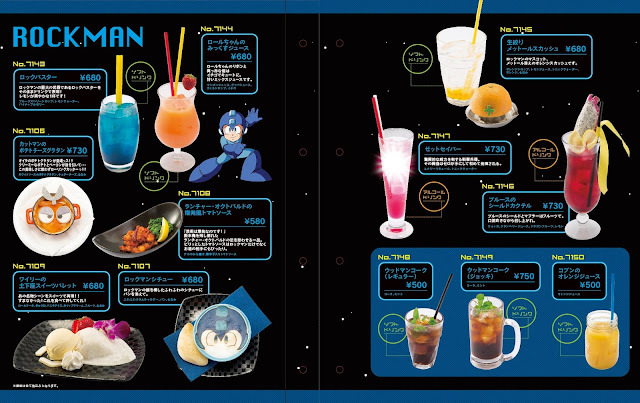 The Rockman menu, like most items at the Capcom bar, will be offered for a limited time only. Themed food and beverages are in constant rotation so if you miss out the first time round, chances are they'll show up again. that's cool.... but the kirby café is WAAAAY better... and they still releases lots of game for him! Incredible right? What's Roll's drink (No. 7144), exactly, and why is it orange? C'mon, Capcom Café staff... Get your head in the game. The description say "A cute strawberry for Roll's ribbon and her red dress. A sweet taste of mixed juice" and it uses mango juice, guava juice, strawberry and pomegranate syrup. Maybe they didn't want drinks of the same color? Zero and Blues' drink is a different red, though the Met and Kobun are both orange juice.